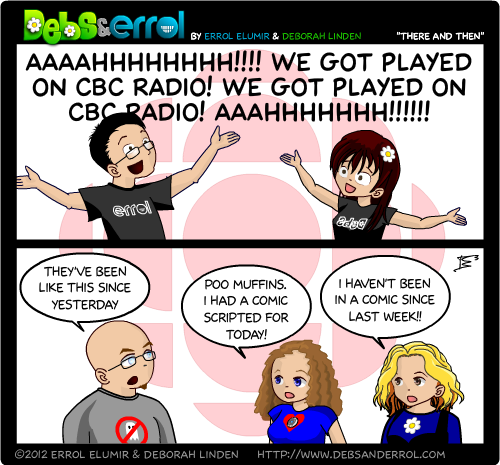 Errol: Debs wanted to do this comic for today. I said we probably should wait till the weekend where she has more time to draw. Then I figured, she’s right. It should be today. Poor Debs. ← We Got Played on CBC Radio! Huzzah! D&E was on CBC Radio? Really? When did this happen? Congrats again guys, one small step on the path to greatness! This image only consists of simple geometric shapes and/or text. It does not meet the threshold of originality needed for copyright protection, and is therefore in the public domain. Although it is free of copyright restrictions, this image may still be subject to other restrictions. You should be in the clear, but don’t quote me on it. @Errol, nice. Also, can you fix that HTML for me, got excited to post and forgot to clean it up. @Kelson, Hmmm, I don’t know if the comments allow for “Q SITE”, but I could be wrong. Anyway, just in case, I made it a linkable block quote. @Errol, it was supposed to be a “q cite” but I mistyped. @Kelson, Whoa, I thought I wrote “cite” up there. My brain is messed up. @Errol, It’s a CBC high, it will wear off in a few days. Do I really sound this cynical or is it just creative licence?? @Mercenary Pen, I’VE HAD IT WITH THESE MOTHER-FAWMING PUNS ON THIS MOTHER-FAWMING SITE!